Wild caught fish are one of the last ingredients where one can truly taste the “natural” environment. Protecting that is vitally important. We decided to cure this Bristol Bay Sockeye Salmon instead of cooking it because of its minimal fat content. 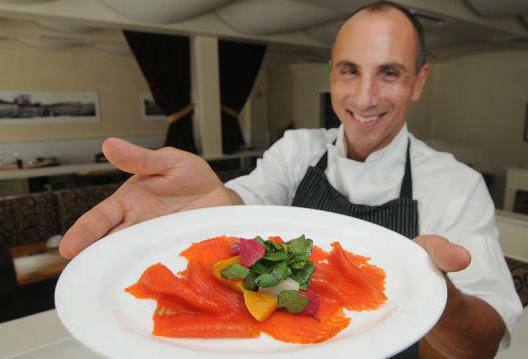 In this way we could also preserve and highlight the depth of flavor of the wild fish (as opposed to farm raised fish). It’s important to us that things taste like they are supposed to, that they are reflective of their environment and their terroir, and that their story is borne out in their taste. Wild salmon, and Bristol Bay Sockeye in particular, are a valuable resource that need to be defended and protected so that we can share these treasures with future generations. Projects like the pebble mine that endanger natural habitats and their communities do nothing to sustain these precious resources. Recipe from the Boston Herald "Reel ’em in: ‘Catch’ author, local chef share ?their passion for nation’s seafood." You can find shiso and mirin at any Asian food store - just walk in and ask! While you're there, pick up your ginger root too. Combine shiso and lemon zest in a food processor and process until finely chopped. Combine mixture with salt and sugar. On a large piece of plastic wrap, place about 1/6 og cure mixture in shape of one fillet. Place fillet, skin side down on top. Place about 1/3 mixture on flesh side of fillet. Wrap tightly in plastic. Repeat process with other fillet. Place salmon skin down between two sheet pans and place weight on top of pan. Refrigerate 2 days. Remove and wipe off remaining cure with damp towel. Wrap in plastic again and refrigerate one more day. Slice salmon as thin as possible and serve with soy-ginger vinaigrette. Place ginger root and canola oil in a small pot. Simmer over low heat. Remove and let stand 12 hours. Straing oil through cheesecloth. Combine 6 ounces ginger-flavored oil (may end up with more) with soy and mirin.